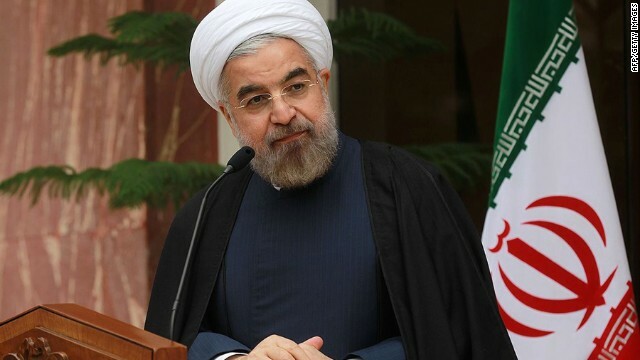 Iran will not dismantle any of its nuclear facilities as part of an effort to reach a long-term agreement to limit its nuclear development, Iranian President Hassan Rouhani said in an interview published Friday in The Financial Times. Asked during the interview if dismantling Iran's nuclear facilities was a "red line," Rouhani said: "100 percent." Rouhani's statements are unlikely to sit well with Israeli Prime Minister Benjamin Netanyahu, who has said any long-term agreement with Iran over its nuclear development must lead to the dismantling of the country's nuclear capability. Iran and the so-called P5+1 - the United States, Britain, China, Russia, France and Germany - agreed Sunday to a six-month deal to limit Tehran's nuclear development. Well said, Terry. I just want to add here that the Kurds, like the Israelis, have a right to set up their own home state in the Middle East. Unfortunately, Everyone seems to be ignoring this simple fact. Besides, I agree that all countries need to be held on an equal footing like Israel and Iran. Am I to take it Trevor, that you don't believe in a Kurdish home state? The Israelis haven't had one between 607 BC and 1948 AD. just as the Kurds haven't had one since around 200 BC. Even the Tamils in Sri Lanka deserve one although they failed to achieve it recently. No. Read my post again...my comment talks about Israel and your clear support of, again, absurd COAs mentioned by Terry...my comment makes no mention of the Kurds. Have you noticed how when things do not make sense or add-up it is because they don't make sense and don't add-up yet Chimps the World over can sing the Monkey song like they are perfect...Afganistan is a perfect example...the Chimps in Afganistan are the "same" Chimps from Vietnam...more or less...Chimps here Chimps there Chimps Chimps everywhere...except the Chimps are not here...the Chimps continue too be there. iran has 1 nuclear reactor why should iran build any moore iran has got what it wanted its russia that is pushing iran to build a second 2 reactor at busherhr iran does not need another reactor or 20 reactors or any foolish stuff like that anybody that tells iran otherwise is in league with israel. if rouhani builds moore reactors then the people will rebel this is what happends when one does things that are not in the realm of reason. JAST = Just Another Stall Tactic. Iran and the United States are to establish a joint chamber of commerce within a month, with direct flights also planned, an Iranian official said Wednesday in a newspaper report. "Iran-U.S. chamber of commerce will be launched in less than one month," Abolfazl Hejazi, a member of Iran's Chamber of Commerce, Industries, Mines and Agriculture, told the English-language Iran Daily. In the wake of a historic accord on Sunday between Tehran and major powers on Iran's controversial nuclear program, Hejazi also said his country was ready to start direct flights to the United States. Iran remains in full possession of its nuclear potential, has not renounced its aim of wiping Israel off the map, and continues to be the leading sponsor of worldwide terrorism. Yet the United States is starting to treat it as a friendly nation? I am tempted to verge into profanity. Why on earth would we want direct flights from Iran to the United States? Iran would control the cargo hold on such flights, which would be able to enter American airspace. Does anyone think the Itanians are so respectful of human life that they would not martyr a planeload of passengers (sending the Muslims to heaven in their view) for the pleasure of detonating a nuke a few thousand feet above New York City? I hope and pray that this report is false. Let's all hope and pray that it isn't. sendthistodave. If Al Arabiya is correct, which if so it would be almost too good to be true, that would be a great event. Only a stupid crazy fool would be against it. Instead of antagonizing each other, The U.S. and Iran could become great partners in that part of the world. Only a fool or supporter of iran's violent regime thought they were going to go along with the treaty. Thank you, acsj. Like I said before, people like you say the most ignorant things when it comes to Iran! Are the religious leaders of Iran truly any more evil than the right-wing thugs in Washington? Hardly! Forget it, John. People with their tiny minds are going to go on saying most stupid things here on this web page, no matter what! I got so disgusted and irritated with their ignorarance that I quit posting here some time ago. With this kind of ignorance shared by so many people, what chance does this country stand? Did our schools fail or what? You are asleep at the wheel John – about to crash. The treaty isnt about dismantling its nuclear facilities egghead. The deal agreement wan Xmas special for the Iran liar regime with helping putin and UK?! THIS is very confusing, IRAN Is NOT GOING TO DIsmantle ITS NUCLEAR TECNOLOGY, THEN WHAT DID THE P5 AND THE OBAMA ADMINISTRATION AGREE TO?????????? Another ignorant comment from another obvious Tea Partier above! How many times do I have to say that war is not a sporting event but a tragedy in the making? It's easy for bozos like the one above to like a war as long as he won't be in it!!! To him, it's something like watching a hockey game. I agree 100% Kerry and Obama act like they got a historic agreement out of Iran now it looks like they didn't get squat. Of course the Obama brown nosers will continue to live in denial over this and pretend reality doesn't exist once again. Gee Ralph, if being stupid was a virtue, you'd truly be a living saint! The agreement wasn't about dismantling, and why should they. Iran has a right to nuclear technology. The non-proliferation treaty isnt about no nuclear technology, its about no nuke weapons. Iran doesn't have nukes and there is no proof they are making weapons. Benjamin Netanyahu needs to have something to complain and wag his tongue about! What would he do if "the world" decided he should not have nuclear weapons? Of course, he didn't have to build them. Guess what? Iran won't have to build any either. Pakistan, China or Russia are good nuclear bomb merchants! Anything and everything is for sale! Now, Benjamin Netanyahu, how are your "talks" going with your neighbors? Last I heard all the Palestinian team resigned! Your preferred negotiating tactic didn't work very well. Now what? Go start up your bull dozers again? As long as the Iranians don't produce any nuclear weapons, there is no reason for them to dismantle their nuclear facilities. In fact, the French get 82% of their electricity from it's nuclear facilities. Does anyone here realize or even know about that? Judging by the ignorant things some people say here, the answer appears to be No!!! No one wants to hear the truth about anything. twist your words does it even matter anymore?